One of the pleasures of summer is enjoying a glass of rosé wine in the backyard with a friend. Rosé varies, for sure, but in general it’s a crowd pleaser and doesn’t take itself too seriously. It’s a touch fruitier than many white wines and makes friends with whatever summer food you’re eating, from grilled salmon to tomato salads. And, hey, it’s pink. I can’t help but think perfumer Mathilde Laurent was sipping a chilled Provençal rosé when she created the Cartier Baiser Volé flanker, Baiser Volé Lys Rose. It’s that kind of fragrance: easy, versatile, fun, and perhaps, ultimately, forgettable. Lys Rose gives off a lot of pepper, woody musk, and dry raspberry at first sniff. It almost reminds me of the chocolate-y whiff you get when you lift the lid from a box of Whitman Samplers. The raspberry is definitely noticeable, but it isn’t jammy in the least, and no one would mistake Lys Rose for a Jolly Rancher candy. Despite the raspberry and Whitman Sampler comparison, I wouldn’t call Lys Rose particularly sweet, either. Pepper is a major player throughout the fragrance’s short life. The pepper does a good job of cutting the white musk so that it smells less like shampoo. Also, I smell a lot more woody musk in Lys Rose than in Baiser Volé. It isn’t enough to send me for the Advil, but I know it’s there. In short, Lys Rose is a quiet, dry raspberry and pepper scent with a bit of jasmine/lily and a clean, musky shell. Despite what the press release says, I wouldn't call it "powdery" at all. The first few times I wore Lys Rose, I couldn’t see the link between it and Baiser Volé. It wasn’t until I sprayed Baiser Volé next to Lys Rose that I smelled the buzzing jasmine and hint of green and truffled earth they share. Another reason I had a hard time smelling Baiser Volé in its pink flanker is that, on my skin at least, Lys Rose has close sillage and not a lot of persistence. Even when I dumped the rest of the sample vial on my arm, I barely squeezed an hour and a half of life from it, and I didn’t get much dimension. But maybe that’s what a summer flanker is all about. Most of the time, we don’t drink rosé for the memory of what an awesome wine it was, but rather for the memories of the evenings we spent when we drank it — for the friends, the fireflies, the laughter. You might want to think of Lys Rose that way, too. To me, it’s no masterpiece, but it stands in for something relaxing and easy. I’m okay with that. 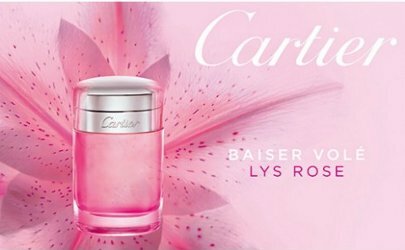 Cartier Baiser Volé Lys Rose Eau de Toilette is $88 for 50 ml and $128 for 100 ml. It’s available at nicer department stores, from Macy’s to Neiman Marcus. Thanks for the review. I think I’ll put this one a little lower on the desperate to try list. I love Baiser Vole edp, and IMHO it is such a great and perfectly complete fragrance that it needs no nothing of a flanker. The review you give of this reminds me very much of my feelings about the Ferre Rose that was out/still out? by Francis Kurkdjian a few years ago: light, fresh (in a good way), flowery, pink and with a dash of watermelon accord that gave it an interesting twist…. but ultimately not interesting enough. Kind of like a great lipgloss that you put on and like but then just forget about after it wears off in an hour, and ends up living most of it’s life in the bottom of your handbag. I admit that I’m not going to rush out and buy this one, either. I have plenty of happy, light fragrances to go to already. No need to drop $88 for another one. Great lip gloss comparison, by the way! I tried this one recently and while I liked it well enough I much prefer the original, the EDT that is. I’ve had a bit of an iffy relationship with the EDP. Love the essence as well, and have yet to try the extrait. The extrait and the EdT are my favorite takes on Baiser Volé, for different reasons. The essence was a little too loaded for vanilla for me. Do try the extrait, if you get the chance! I tried this one at Saks, and thought it was just ok. I had basically the same problem with Lys Rose that I had with the EDT, which is that while I don’t need big sillage or anything, I want more than just a barely-there skin scent. I blind-bought a bottle of the EDT at Marshall’s, and I ended up swapping it, so I don’t imagine I will be buying this one if I come across it. Hey, finding the EdT at Marshall’s is pretty great! Nice find. When I tried this, I got a sheer, diffusive “pinkness” along with the raspberry and florals that I think I couldn’t break into its composite parts as well as you do here, Angela. I could understand why it might be appealing, but that pink thing is just not for me. The pink thing is definitely not for everyone! At least Lys Rose puts “pink” right up front in its name and juice color–a good warning for those who don’t cotton to pink. Didn’t do anything for me, but I did really like the bottle! I like the bottle’s style, too! Doesn’t sound like it is even worth trying. But, gosh, that bottle is gorgeous! You never know–you might love it. Or not. I agree with you on the bottle all the way! Cartier has been disappointing lately, like L’artisan..but not as disappointing as L’artisan..:p.
Hopefully they’ll both put out something you love soon!